Katie Prescott's daughter Heidi, 11, has had the condition since birth, but was not diagnosed until she was three. "She can't walk on her own, she has to hold on to me and can only take a few steps," Mrs Prescott, from Wolverhampton, said. "She struggles with her arm strength, taking a jumper on and off is difficult." Mrs Prescott added Heidi was mentally unaffected, very bright and aware of what was happening to her body. She has weekly physiotherapy and uses a standing frame. Mark and Panna Wilson, from Oadby, Leicestershire, said they were considering moving so three-year-old Aadi could access Spinraza. Aadi was diagnosed with SMA at 15 months and now struggles to breathe. Mr Wilson said: "Aadi is a bright, funny, clever toddler, but his mobility has deteriorated, and that's difficult to manage as parent. "There is a treatment that could change our life. "We know there is no certainty and that Spinraza doesn't have the same effect on everyone, but it gives us hope." Charity TreatSMA said Spinraza, the trade name of a drug containing nusinersen, could normalise protein levels in the gene that causes SMA and stop motoneuron degeneration. The charity has arranged for parents to protest outside a NICE appraisal meeting in Manchester later, calling for the use of the drug to be approved. Mrs Prescott's Labour MP Eleanor Smith raised the subject at Prime Minister's Questions in February, calling for the drug to be made available in England, as it will be in Scotland. An independent committee will meet in public later before making a recommendation in a private session. NICE will then publish a draft recommendation within a month. If no appeals are made, it will later be published as final guidance. Meindert Boysen, director of the Centre for Health Technology Evaluation at NICE, said it had been in discussions with the drug's maker, Biogen, about how it can address uncertainties and be made cost effective. Mr Boysen said it had "taken us longer than we would have liked to get to the position we're in today" but it was time for a "meaningful discussion about Spinraza" and "what it would take to make it available to patients in England". 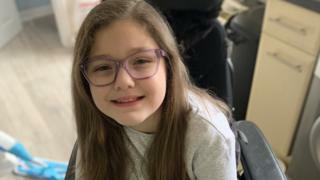 Doug Henderson, from Spinal Muscular Atrophy UK, said there were "unacceptable delays" in England, while Rob Burley, from Muscular Dystrophy UK, added: "Without access to Spinraza, children may irreversibly lose the ability to walk, crawl and swallow."